When it comes to invertebrates, many aquarists immediately think of shrimp or crayfish. However, there’s another group of fascinating inverts that can be kept in aquariums: crabs! Unfortunately there is still a lot of misinformation out there about these clawed critters. Many brackish crab species are sold as suitable for freshwater tanks and many species that require a land area are marketed as “fully aquatic”. Of course this inevitably leads to dead crabs and disappointed aquarists. All this conflicting info can be rather confusing: which crab should you go for? Do they need brackish or fresh water? To hopefully clear things up a bit, this list contains five fully freshwater crab species! With a carapace size of around 1 cm (0.4 inch), Thai micro crabs are by far the smallest crab species on this list. These tiny crabs are fully aquatic and naturally found in a freshwater river in Thailand. Introduced into the aquarium hobby not too long ago, they are still not very well-known but quickly gaining popularity and becoming more readily available in aquarium stores. Thai micro crabs can be quite shy and are a bit fragile, which makes them most suitable for very peaceful tanks with plenty of hiding places. They make a good addition to heavily planted dwarf shrimp aquariums and other calm setups without active or carnivorous tankmates. Never introduce them into improperly cycled aquariums, as they don’t respond well to fluctuating water values. These little crabs are filter feeders that can often be found sitting in the water current ‘fishing’ for food. They will also take normal foods, though. You can offer them shrimp foods and crustacean pellets to provide plenty of calcium and keep them healthy. A full Thai micro crab caresheet can be found here. The various colorful crabs from the Geosesarma genus (such as Geosesarma dennerle pictured at the top of this article) are often collectively referred to as vampire crabs due to their yellow eyes that almost seem to glow. Undoubtedly the most spectacular species on this list with colors ranging from deep purple to neon orange. Although they are actually not fully aquatic and therefore not suitable for normal aquariums, vampire crabs are included here because they do still need access to an area with fresh water. If you’re interested in keeping them be prepared to venture into the world of paludariums, which mostly consist of land area but contain some water as well. A great opportunity to work with terrestrial plants and emersed aquarium plants to set up your “aqua”scape for a change! For a small group of vampire crabs a heated paludarium of at least 19.5″/50cm is recommended. A ratio of 2/3 land and 1/3 water should be a good place to start. Your land area can be heavily planted with various types of moss and other plants. The submerged area should be cycled and the water should be relatively hard with a higher pH. Perform water changes and keep an eye on your water quality as you normally would. Like most other crab species, vampire crabs are omnivores that can be fed a varied diet consisting of invertebrate pellets, insects, vegetables and pretty much anything else. Crabs from the genus Platythelphusa are not very popular in the aquarium hobby yet. They are naturally found in Lake Tanganyika and are definitely an option to consider for aquarists looking to set up a (Tanganyika biotope) aquarium for a fully aquatic crab species. Specific care requirements for these crabs are still relatively difficult to find, not in the least because the different subspecies are not always identified correctly even though their size varies quite a bit. At around 6 cm (2.4 inches) Platythelphusa armata is the largest. A small aquarium is probably not a good choice for Tanganyika crabs, as like all crabs they need to be able to find a hiding place when it’s time to molt. A tank of at least 35.5″/90cm is probably a good starting point. Be sure to keep in mind that these crabs are not community safe and will consume everything they can get their claws on. 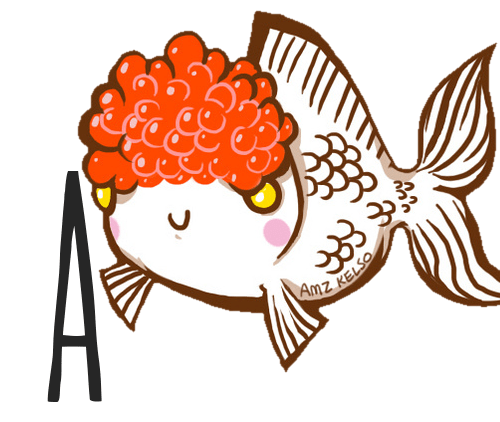 They are said to have an appetite for aquarium snails and will not hesitate to catch weak fish if they get the chance. Despite this they can probably be kept safely with many quick Tanganyika cichlid species. As with all crabs, be sure to use an aquarium hood and cover all holes to prevent escape. Not sure where to find Platythelphusa crabs? Your aquarium store probably won’t carry them, but might be able to place a special order for you. Although not the easiest freshwater crab species to keep in the aquarium, panther crabs originating from Sulawesi can make an interesting project for more experienced aquarists. With a carapace size of up to 8 cm (3.1 inches) they are one of the larger crab species on this list. This means they require a relatively large aquarium (at least 31.5″/80cm for one crab). Tank size is especially important when housing multiple panther crabs together, as they are quite aggressive both towards their own species and other tankmates. Keeping pairs or harems is usually the way to go, because multiple males don’t seem to go too well together. If you’re not sure whether a crab is male or female simply have a look at its underside to confirm its gender. Males will have a narrow abdomen plate, whereas that of a female is much wider. Although panther crabs are usually considered fully aquatic, some sources do suggest a small amount of land area in the form of wood or rock that reaches beyond the surface. Like all crab species, panther crabs require plenty of hiding places such as coconut hides as they are very vulnerable during molting time. Like their saltwater namesakes, freshwater pom pom crabs lend their name from the pom pom-like filters on their claws. Still quite uncommon in the aquarium hobby and probably not too easy to find, freshwater pom pom crabs are definitely worth the search for anyone looking for an unusual addition to a (nano) aquarium. Pom pom crabs are fully aquatic and a little larger than Thai micro crabs but, unlike most of the other species on this list, still quite peaceful and community-proof. Most sources report them paying no attention at all to even the smallest tankmates. Even dwarf shrimp such as cherry shrimp are left alone. I look forward to seeing more of this small but active crab species in the future! The leopard crab mentioned above is not the only colorful freshwater crab originating from the lakes of Sulawesi. It seems as though every aquarium critter originating from this Indonesian island is more beautiful than the previous! The Matano crab, also known as Syntripsa matannensis, is one of the two currently known members of the tiny genus Syntripsa. 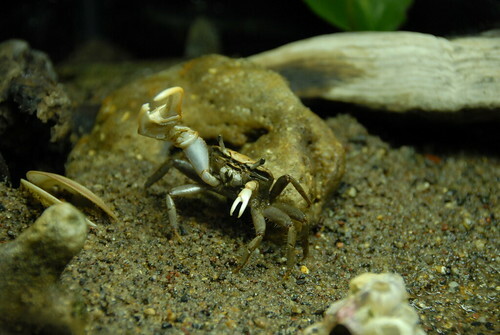 Like pom pom crabs, the Matano crab is still a very new addition to the aquarium hobby. They don’t seem to be imported very frequently yet at all and you probably won’t come across them at your local aquarium store. They’re worth searching for a seller for, though: their almost black carapace makes a real statement in the aquarium. If that’s not enough of a pop of color for you, there’s also always the purple Matano crab, which features yellow legs and a purple carapace. Not much has been published about the Matano crab so far but luckily we can assume a little bit about their care based on their natural habitat. For example, inhabitants of the Sulawesi lakes appreciate hard water with a higher pH and high temperatures. Many of the crabs sold in aquarium stores as suitable for fresh water should actually be kept in brackish setups. Species that are commonly wrongly sold as freshwater include red claw crabs (Perisesarma bidens), fiddler crabs (Uca genus) and hermit crabs. Always do some research before purchasing a crab and be sure to look at multiple sources! Fiddler crabs are a fascinating addition to the aquarium but you’ll have to set up a brackish tank to keep them successfully. If you have any more questions about freshwater crabs, have a species to add to the list or want to share your own experiences with any of these species, don’t hesitate to leave a comment below! New freshwater crab species are discovered and subsequently introduced into the aquarium hobby regularly so new developments are not uncommon. Cover photo: Geosesarma dennerle 1.jpg by Nicholas Palm. I live in the tropics near to a stream and found a baby crab there and he has been in my aquarium for more than 6 months. He has moulted several times and eats raw pieces of fish. I have one plant that goes above the water line and he is growing. The tank is fresh water and I have gouramis, tetras and zebra all together. I have no idea what type he is but he certainly is not a salty and he spends all day in a secluded spot in the tank. Would have loved to send some pics to help identify him. You can try posting a photo the Aquariadise Invert Keepers FB group if you’d like, we can see if we can figure it out. I love you! I mean, I was literally asking myself what critter would fit into my 10 gallon paludarium/riparium aquarium I was preparing to build and you publish an article on freshwater crabs … in all fairness, you published months ago, but I just saw it appear on my facebook feed. Anyway … I think the Vampire Crab might well be the answer to my quandary!